I spent last week in an intensive novel-writing workshop with about a dozen other writers in a warm and featureless room on the U of T campus. I recommend the experience highly. I hadn’t read anything critically since university, and have since become quite a lazy reader in more ways than one. I do however submit my work for evisceration on a regular basis as part of my day job, and while the majority is neither fiction (I do my best, at any rate) nor personal in nature, it does carry with it a minute fraction of my creative soul. So in one week I have become a better reader, and my work stands to benefit from the dispassionate critique rendered by a room full of strangers who likely know at least as much about what I’m trying to do as I do. 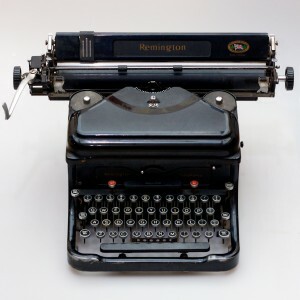 At one point I found myself discussing my earliest recollections of attempting to write fiction, and the first and most vivid memory was of sitting in the living room in my parents’ home, pounding away at the nominally portable typewriter my father had purchased while a university student in the 1950s. I had forgotten the make, merely remembering the approximate vintage, the mustard-yellow tweed case, and the fact that its profile resembled that of a Volkswagen Beetle, one of which we also owned at the time. A bit of research online reminded me that it was a Remington portable, possibly an antecedent of the Quiet-Riter and Office-Riter lines, and also hipped me to the fact that I had missed the opportunity to pick up a nearly pristine example of the species from a California-based Etsy seller by about six months. Further research turned up a lone specimen on Ebay, which may be the subject of future reminiscences. 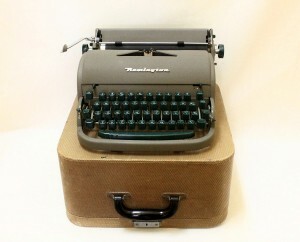 In truth, if one wishes to set aside sentimental attachment to objects from one’s childhood (as I, obviously, do not), there are better-looking typewriters out there to use as objets d’art, to polish up and place on your bar as a way of announcing to visitors that “a writer lives here.” And in my research I came across an irresistibly priced made-in-Canada Remington Noiseless from the 1940s, on Craigslist, right here in Toronto, or as near to it as to not be worth an argument. Am I not, though, through this obsessing over the historical tools of my craft, merely occupying my mind further with trivial, material pursuits and, not to put too fine a point on it, procrastinating? My answer: perhaps. There was, however, another topic which came up during the mid-week panel discussion, and that was the unavoidable and incessant distraction inherent in trying to write a novel on a device that is connected to the internet via email, Twitter, Adium, Facebook, LinkedIn and, ah, WordPress. 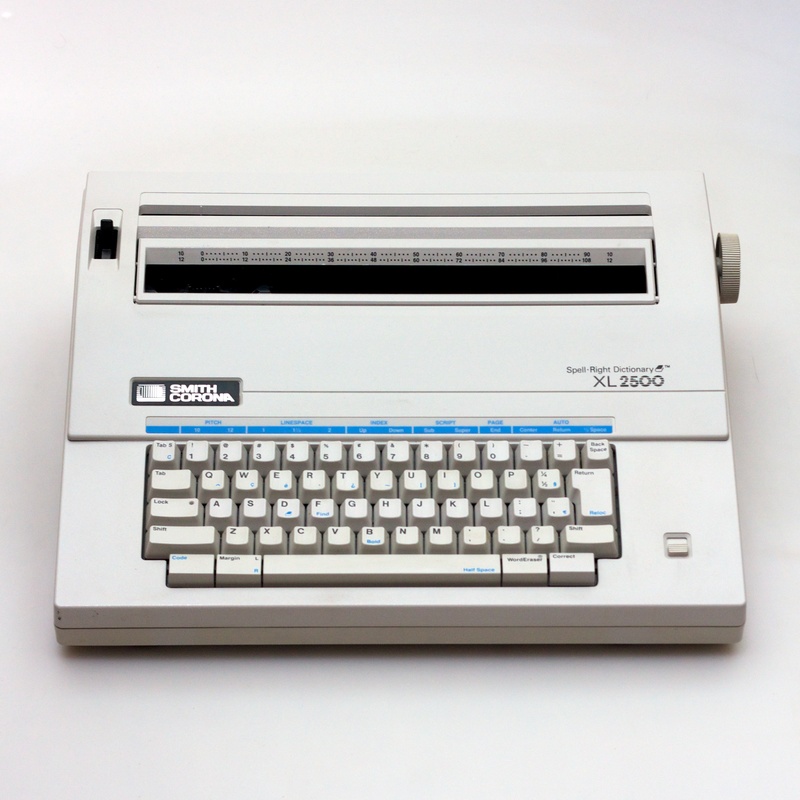 Of course a manual “type writer” wouldn’t do at all. You’d almost certainly give yourself tendonitis in mere hours with all that laboursome pushing down of keys and lobbing of type bars toward an incrementally-rotating platen. The perfect solution would have to be some kind of “electric type writer” which imprints letters on the page through the precise application of electrical energy, an action duplicated almost perfectly by a Smith Corona XL 2500, such as can be found on Craigslist for a mere $25, if you’re looking in the right place at the right time. 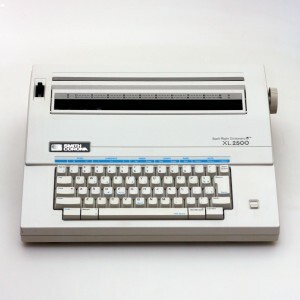 Just as you near your destination, however, terror strikes at your heart with the swiftness and power of an IBM Selectric (by God those things could stamp tin, couldn’t they). What if, once you have committed your masterpiece to paper, you are visited by a disastrous fire, or strong wind? We’ll have to find some way to store that information once you’ve gone through all the trouble to type it out. Ideally, you’d have some way of transmitting that typed information to some magical, ethereal storage space far from danger, some heaven for first-draft texts, yes, somewhere in the clouds. 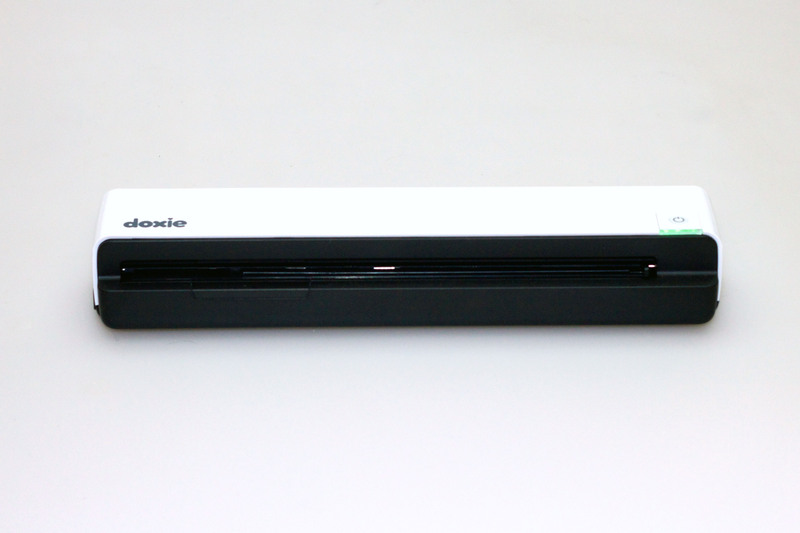 Luckily, like any stylish technophile, you have your handy Doxie scanner. You take your typewritten manuscript, feed it into one side of this rechargeable document scanner that’s about the same dimensions as a gift-size Toblerone, upload it into your computer where it’s converted, via proprietary OCR software, into a text-embedded PDF, export to text, copy and paste into Scrivener, save to your Dropbox folder, and voilà. This was a thoroughly enjoyable read. Nice read Steve. Subjects connect like serpents mating.